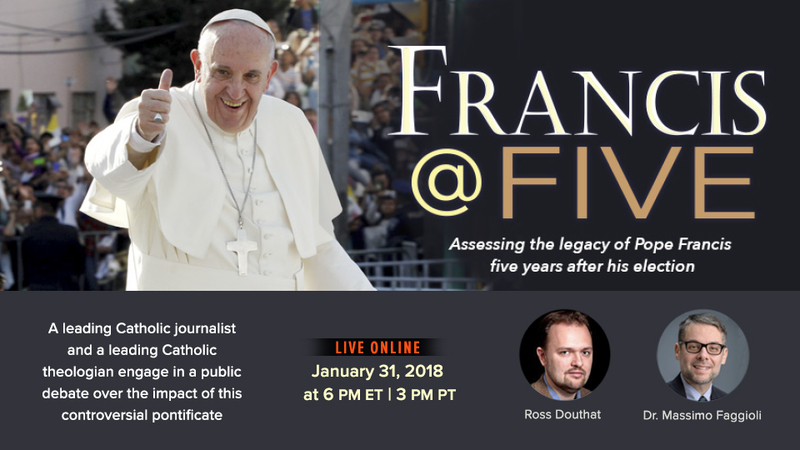 In just a few weeks, Pope Francis will be celebrating the 5th year of his papacy. What better way to mark this milestone than by looking at the kind of impact he’s had in the Church and in the world thus far? A debate organized at a Jesuit-run university last January 31 did just that. To be sure, this papacy hasn’t been without controversy. People - Catholics - who have taken their debates over his pontificate to social media, have also exposed the biggest issues at hand surrounding the papacy today. These “wars” happening mainly on what is referred to as Catholic Twitter, involves people from all walks of life. Even prominent Catholics are all the more kept accountable for the words they publish on their own platforms, good or bad, that depends on your audience. Two of these prominent Catholics, who have been “jousting” on social media, calling each other out, are Massimo Faggioli and Ross Douthat. Faggioli is a theology professor at Villanova University and writes for Commonweal Magazine; Douthat is a renowned columnist for the New York Times. Their exchanges began a few years ago. They’ve not only tweeted at each other, they’ve also written about each other. Faggioli is seen as a more progressive Catholic, while Douthat is seen as conservative. Last September Douthat, in an article where he makes mention of Faggioli, wrote: “There is no way forward save through controversy. Postpone the inquisition; schedule arguments instead.” The invitation was taken seriously. The director of the Center on Religion and Culture at Fordham University in New York City, David Gibson, approached them with the idea of a debate in a place of their choosing. They both immediately agreed. With the help of Religion News Service, the date was was set and thanks to the collaboration of Salt and Light TV, the event was broadcasted live on the web. The debate was attended by over 250 people while thousands more tuned in online. This was the first opportunity Massimo and Douthat had to joust face-to-face. It was also an opportunity to clear a lot of the misconceptions around their exchanges over social media. You don’t necessarily see the men behind the tweets or the articles. As Gibson expressed ahead of the debate: although both men have been seen as “combattants”, they are both “good people, professionals, Catholic” and their conflicts are not “personalized”. “They can have sharp disagreements” - and did they ever! - but they can still “remain in the conversation”. Those disagreements involved, for most of the debate, the Pope’s apostolic exhortation Amoris Laetitia (The Joy of Love), and in particular what concerns divorced and remarried Catholics and the sacraments. That conversation led them into arguments over the reception of Vatican II, change in Catholic doctrine, and engaging “between the law and the pastoral reality on the ground”. Not surprisingly, despite their disagreements, they found common ground more than once. It was refreshing to witness a debate, which could quickly become vicious over social media, where both “opponents” display respect and charity towards the other. Pope Francis would be happy. If you haven’t watched the debate yet, follow this link for the full video. An audio version is also available. Emilie Callan, a producer at Salt and Light, has recently been named its roaming ambassador, spearheading its newly formed Community Outreach program. Catch her in a variety of programs on S+L TV or at an event near you!